What is the Tournament of Roses? 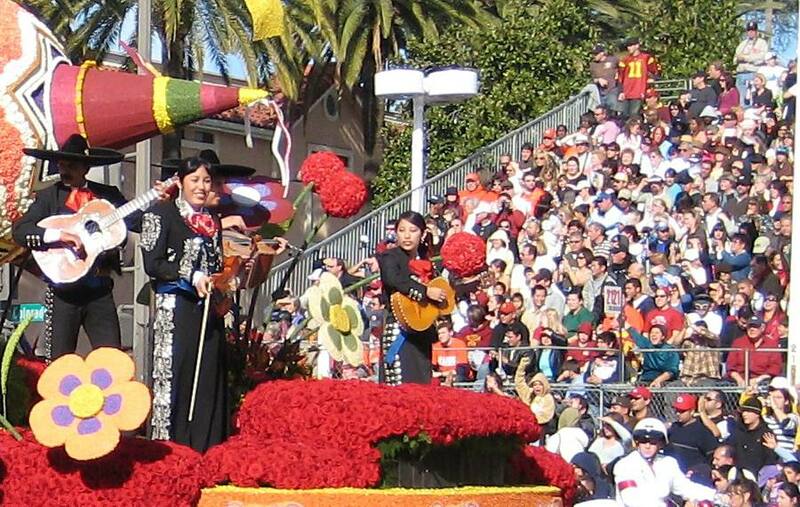 The Tournament of Roses consists primarily of the Rose Parade and the Rose Bowl, both taking place annually on January 1st. There are also activities leading up to the main event where you can see the parade horses and marching bands perform or even help decorate the floats. You can participate in individual Tournament of Roses activities or buy an official tour package including hotel, events and some meals. The Rose Parade is a 5.5-mile parade of floats, marching bands and equestrian teams that occurs every January 1st in Pasadena, CA. The floats in the parade are decorated with plant matter including seeds, grasses, bark and, of course, flowers. The Rose Bowl is a post-season college football game between the top-ranked team from the Big-Ten (northern states from Iowa to Pennsylvania) and the top-ranked team from the Pac-10 (west coast states plus Arizona). It takes place annually on New Years Day at Rose Bowl Stadium in Pasadena, CA. The Equestrians who will participate in the Rose Parade gather for a pre-parade display of their talents. Stroll through the stables and talk to the riders. Learn about the various tack and the many different breeds. Watch these beautiful horses and talented riders perform drills and dances, and demonstrate trick riding and roping. As well as ongoing equestrian performances, demonstrations and exhibits, there is live music and food and drinks for sale. Bandfest features the prizewinning bands of the Rose Parade performing the field shows that made them famous. Three shows over two days give everyone a chance to see these talented musicians, dancers and auxiliary performers in action. For four days leading up to the parade, thousands of volunteers show up to help add the billions of flowers and seeds that decorate the parade floats. If you're in town you can join in the fun. The day after the parade the elaborate floral floats are on display along Sierra Madre and Washington Boulevards in Pasadena for public viewing. This is a much more relaxing way to view the floats than getting up at the crack of down to find a prime viewing spot on the parade route. There is a fee for viewing the floats. Street parking is limited. A shuttle is available from Park & Ride locations in Pasadena. Various tour packages are available from 2 to 5 nights. There are a variety of Parade packages, Game packages and combo packages to choose from. Learn more about Visiting Pasadena and Things to Do in Pasadena.